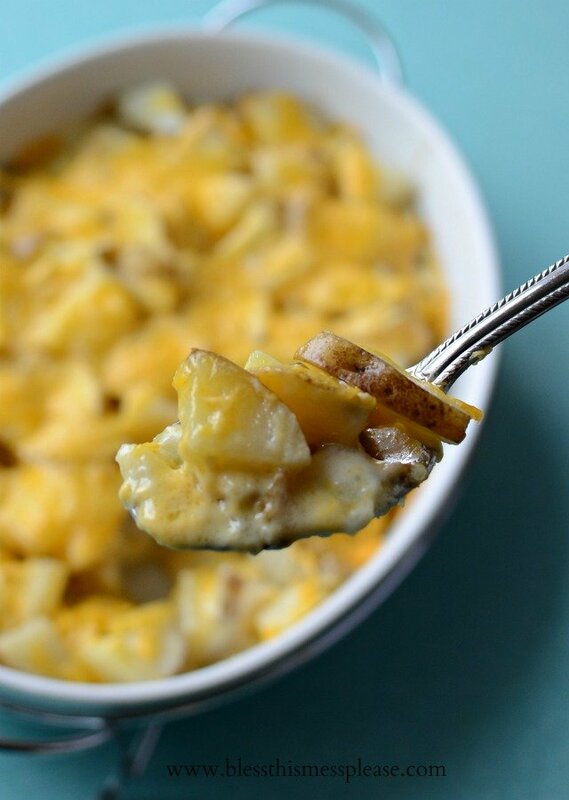 Pioneer Woman’s Potatoes au Gratin are made using whole potatoes (no peeling needed), cream, butter, and cheese and are done in less than an hour. 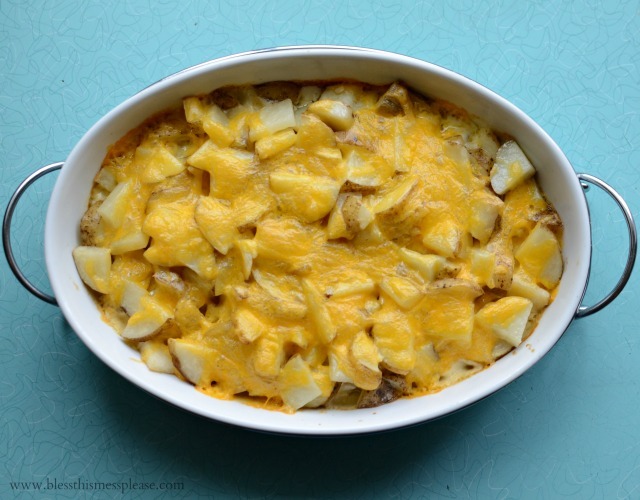 Few things could make Monday better than the recipe for Pioneer Woman’s Potatoes au Gratin. 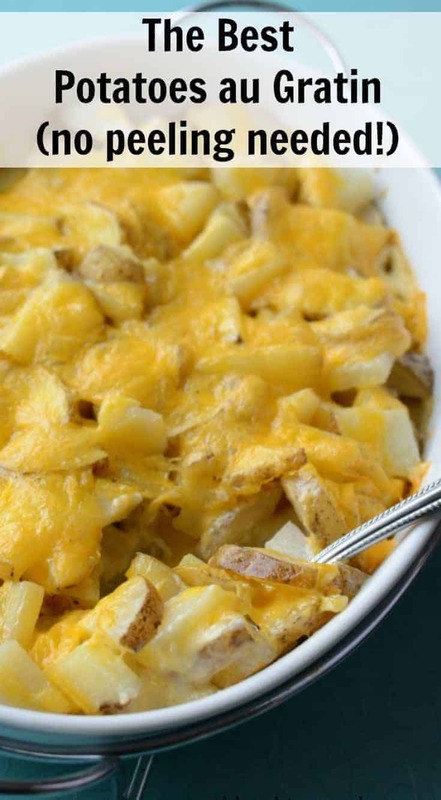 They are very literally perfect; cheesy, starchy, potato-laden heaven. Not only are they delicious, they are easy, too. You don’t even have to peel the potatoes! These are a perfect side for any grilled meat and are one of my favorite dishes to take to potlucks and family dinners. It’s a recipe that you need in your archive, and if eating gluten-free is an issue for you or a family member, I have instructions on how to make this dish gluten-free in the notes. I highly recommend pinning this one; it’s a keeper. Can we go over the fact that you don’t have to peel the potatoes? That makes this recipe worth its weight in gold. It takes a little less than an hour to bake, so I have to be sure to plan for it so that it’s done when I need it to be. 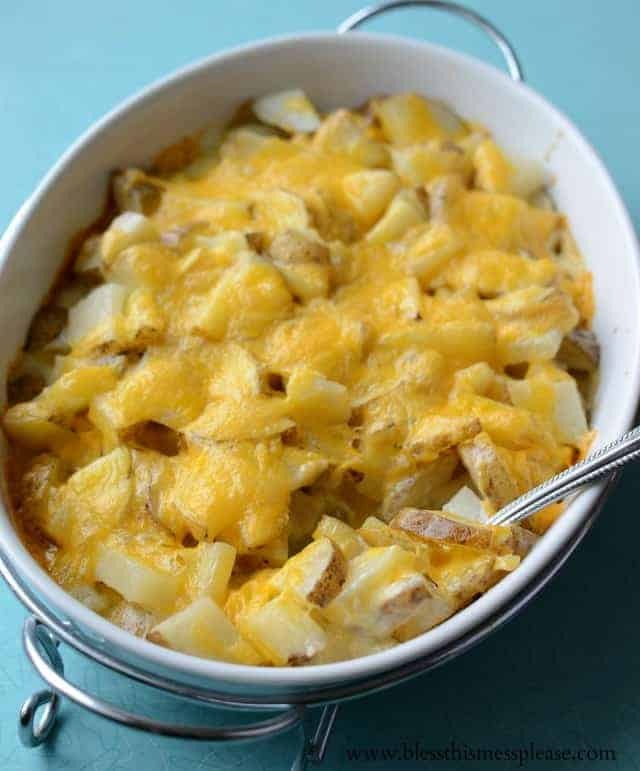 But it only has about 15 minutes of hands-on time that include washing and cutting up the potatoes and layering all of the cheesy creamy goodness in a dish. My kids can even help with the potato washing/cutting which makes the process go quickly. This is one of those dishes that always turns out well and it always tastes good. I can’t wait for you to try it. Long live all the cheese-topped potato recipes. 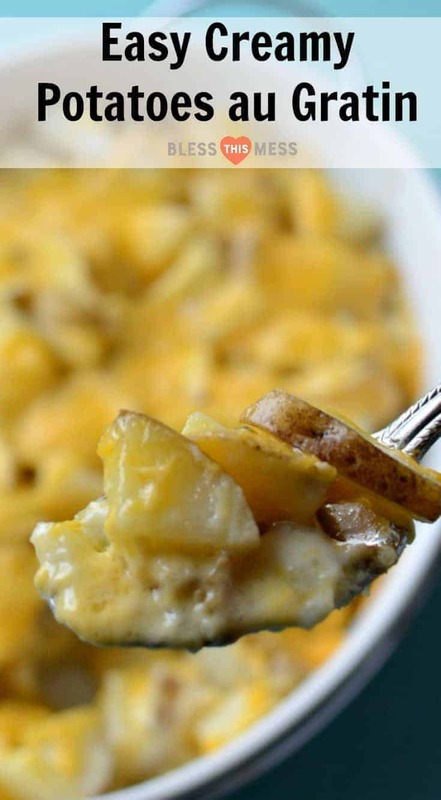 Russet potatoes are recommended for this recipe because of their starch content. They hold together well and cook up into nice soft pieces that stay together. That being said, I have used all kinds of potatoes and it still turns out and tastes great each time. In a pinch, you can replace the cream + milk with an equal amount of half and half. It’s slightly less rich but it still works well. Sharp cheddar cheese is a great classic option for this dish but feel free to use what you have on hand and love, or even a combination of cheeses to fit your tastes. This recipes goes really well next to baked chicken legs, Grilled Honey Lime Chicken Breast, and Grilled Brown Sugar Bacon Wrapped Chicken Skewers or any other meaty main dish. Add some green veggies on the side and you have yourself a meal. Grease the bottom and sides of a baking dish with the softened butter. Wash and scrub the potatoes clean but don’t worry about peeling them. Slice the potatoes into thick slices (somewhere between 1/4 and 1/2 inch thick), then stack the slices and cut them into 4 pieces. Put all of the potato pieces in the bottom of the baking dish. In a small bowl whisk the cream, milk, flour, garlic, salt, and pepper together. Pour the mixture over the potatoes. Cover the dish with foil and bake for 40 minutes. Remove the foil and bake for another 10 minutes. Add the cheese to the hot dish and bake for another 3-5 minutes until the cheese is all melted. Serve hot. To make this recipe gluten-free, switch out the 2 tablespoons of flour with 1 tablespoon of corn starch. Keep any leftovers in an air-tight container in the fridge. Thanks so much for reading and making all of these dreams a reality. I just like you. Bake for 4 mins or 40 mins? 😉 I never thought I’d be one to do it, but I let my 5 yr old & 2 yr old sit with a family of teenagers (after the sacrament) & 1st hr is so much smoother! Church with little ones takes practice; they do not learn how to behave in church and other settings (like eating at other places) without practice. I have survived 4 kids in church each week, youngest is 16, so hang in there. My other secret was a bag packed for each kid, with dollar store color books, trinkets, etc that were quiet(!) and only came out during church and also during the sermon/message part (singing was required in our family). I also packed a small snack (gold fish, cheerios, etc). to tide over hunger pangs. Hang in there, it is tough but worth it. I also feel I have a large tolerance for other families with young kids around me, since I have been there. I can’t wait to try the Au Gratin potatoes, my hubby’s favorite but not healthy if you buy the box kind. Thanks so much Dianna. Sometimes I think “just keep swimming, just keep swimming”. 🙂 Kids are the best though, huh! I’m guilty of this 🙂 Best excuse ever! I can’t wait to try these. Thank you for the work you put I to your blog. 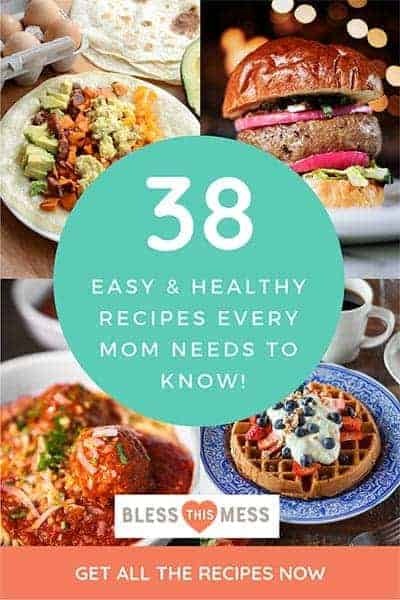 I love reading it and enjoy your recipes. I have tried many of them since I started reading your blog this past year. So, my 2 yr old daughter talks loudly during church. My Grandmother sits in our pew and is going deaf so she cannot hear how loud said little one is! So I have to grab her, focus her attention on me (look at me, kiddo!) and whisper to her that you may only whisper during church and you may not say anything while Pastor is praying. Do you understand? And I tell her to say, “Yes Ma’am,” if she does. She obeys Ma’am do much more than mom, lol! And we have Junior Church that begins right before the messages starts. At that time, 2 and under go to the Nursery, 3 and above go to Junior Church. On Sunday nights an Wednesdays there is no Junior Church. We also do bags of quiet, healthy snacks, coloring books and other quiet activities, during those services to keep little ones entertained and quiet. If fit-throwing starts in, we take the offender out for disciplinary action, and return to the service as soon as we are calm and quiet again. Oh Autumn… these are great thoughts! We have junior church too, so I really only have the little for one hour but it is a long hour 🙂 I’m going try some of these. Thank you! You’re welcome. 🙂 I’m still figuring it out like most Moms. I am reading the Duggars Books because that Momma of 19 well behaved children has to know something we don’t know! 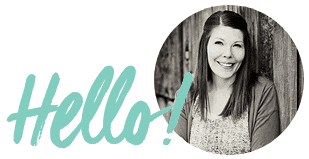 So far her books are filled with awesome, helpful, EFFECTIVE advice. Check them out! 20 and counting is one and A love that multiplies is the other. I tried it today! Yummy!!! I added bacon crumbles because, you know, everything is better with bacon 🙂 I cooked it in my sun oven for about 60 minutes so I didn’t have to heat up the kitchen. This recipe is a keeper! 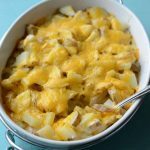 10 Great Potato Recipes for Kids - Madame Deals, Inc. I need these for Easter! So cute.? Cover the dish with foil and back for 40 minutes. Did you mean bake for 40 minutes. Also, BAKE for 40 minutes not BACK. You can do a 9×13 inch baking dish or a 9×9 inch pan, both will fit this recipe just fine. It’s a 2 quart baking dish, so a 9×13 and a 9×9 inch both work fine for this. Can you make this up the day before and keep it in the fridge and just pop it in the oven when you are ready to cook? Yep, that’ll work just great! Just be sure to add about 5 minutes extra in the cooking time to account for starting with cold tators! I made this dish so yummy. Can you make this ahead and freeze it?